A myriad of new color schemes were shown on the Fall 2010 runways that lead us to look towards what will be presented for Spring 2011. Vintage color palettes were very strong led by Miu Miu, Marni and Balenciaga who combined sienna tones with rose, lavendar, yellow, pea green and neutrals such as black and tan. One of the standouts in this new color scheme is ORANGE. 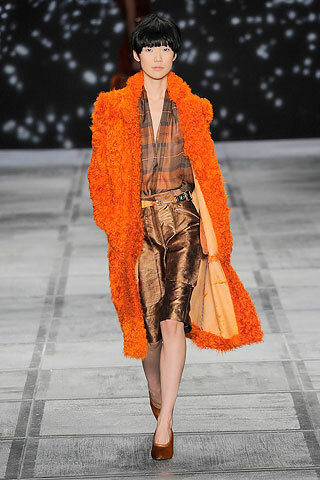 Whether combined with lavender and black at Miu Miu, or brown and rose at Isaac Mizrahi, orange is surfacing as one of Fall’s essential brights. Orange was shown in a few different combinations and tones as referenced below. 1. 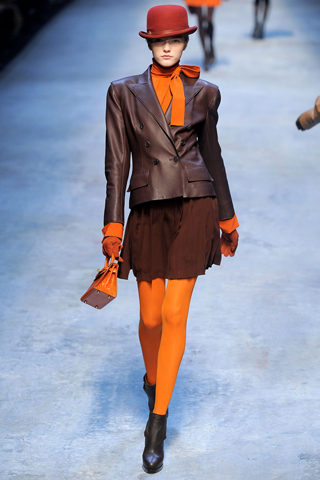 Pairing bright orange with neutrals such as tan and black presents a modern palette with a nod to the past. 3. Classic pairings of black and orange were also shown keeping the palette straightforward and bold. 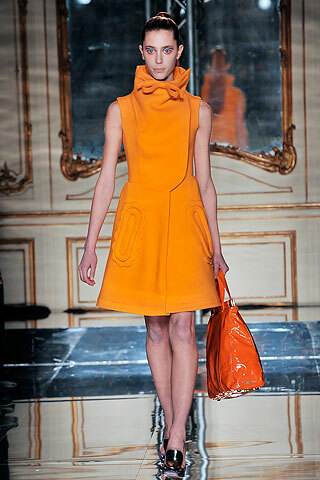 Keep a lookout for more orange combinations to surface on the streets this Fall. The Sche Report predicts that multiple shades of orange including sherberts and siennas will all be very strong for Spring/Summer 2011. Start looking for your favorite piece to be ahead of the curve. Love The Sche report – energizing !